[UPDATE] It looks like they have removed all links below ( or possibly its just from my IP ) either way I now cannot follow the conversation from Lan. To the right was a grab of the forum I had made I bet you cant locate them now! Come On Klout is it so difficult to accept that people want OUT of KLOUT ? I am clearly not ‘Social Media’ enough to warrant the attention of KLOUT. It used to be that their service allowed you to hide your score on Klout and indeed to hide your profile. Now irrespective of your personal feelings about your score it is not possible to login to Klout claim your profile then hide or disable your Klout profile. They will continue to add metrics and content and give you a score and if you dont play the game and take part then its not your fault if your Klout score is low. It is not like I have not asked in public and on their forums but as you can see they do not want to answer the difficult questions. So how about this KLOUT ? I find that your score is personally damaging to my profile and my business. If you cannot remove me from your scoring then I will consider legal action in regards to how you are representing me online against my will. 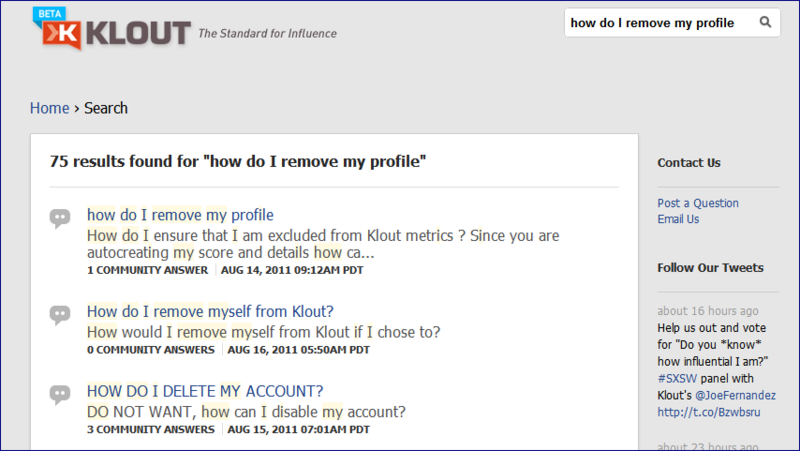 We have successfully removed your Klout account. This means that you are unable to sign in to view your full Klout profile and you are ineligible for future Klout Perks. Should you change your mind in the future, you always have the option to register for Klout again. Which is amazing because not only have they not removed the profile in question at http://klout.com/loudmouthman but my score, my details are still there. Heck I even logged in with an old Cookie despite having removed my twitter authorisation ( way to go on security there by the way Klout ) . Clearly they can remove articles from their forums but they wont let a user out from their website. Hi there. Just Googling around to see what info I can find on this very subject. Checking your “Influence Report” linked above, Klout returns a scary message that “This account has been disabled” or something. That would work for me, now, how did you do it? I asked them to kindly delete my account nearly a year ago after testing it out. They cheerfully obliged. It was only recently I discovered that was a meaningless gesture on their part. I’ve since sent another email asking them to take the page down. Their reply? “Set your Twitter profile to private.” In other words, my right to privacy (or, shall we say, publicity) online takes a backseat to their rights to make a quick buck with a popularity contest. So, did you send them a nasty letter threatening legal action? As far as I can tell, the jury is still out on the matter, but use of a person’s name and/or likeness in such a way as to imply endorsement of a product or service without consent it misappropriation of same, as well as limiting our individual rights to publicity. I’m hoping to hear back from Lan on Monday advising my request has been granted. I don’t see why it’s so hard for them to honor such a simple request. If we used their logo on our sites even hinting they endorse our services, they’d sue us into tomorrow. I was hoping to update this with an explanation that Kout have succesfully removed my profile and then go on and explain what people need to do. They dont seem to be coming back on that conversation so quickly so let me briefly explain here and I will add it to a blog post later. I spoke to jo@klout.com as he is the CEO I wrote him via his about.me profile and through twitter and explained that I was concerned that I could not remove, block or otherwise hide my account. He proceeded to speak to his team and after a day or so my account was disabled. Whilst i was emailing and trying to get a response I also located the SXSW panels and any other news story or blog an dhighlighted my own blog posting pointing out that you cant get out of Klout I think this helped raise the stakes in awareness that I seriously wanted to leave klout. Klout feel it is hard to do this action and they dont understand why people would have a problem being scored. I suggest you follow my lead , talk to Jo , point out this article and point out that your not prepared to take ‘its difficult as an answer. Jo and his team have built this product themselves , not discovered it on some alien shores, they are responsible for what it can and cant do. However we are responsible for taking any action we can to reduce our own risks of liability or slander and this means we should have the expectation that we can ask to be removed. I know that in my own profile Klout suggested I was an influencer of Bill Thompson ( @billt ) and I can tell you that in reality it was very much the other way around. Further people can add all manner of +k to your profile suggesting anything they want about you and whilst it can be deleted the action is most often tweeted at the same time ; if you wanted to damage someone online you would find it easy to create a twitter account to do so. If you want help or know of more people who want out of Klout then I am all in to help out. Thank you for the comment and in-depth advice, Nik. I really appreciate it. As I mentioned in my response on my own site (wasn’t planning on being so involved, promise), I’m going to wait until tomorrow to see what, if anything, Klout’s response to me is on this matter. I’ve made three requests, all polite and understand that the people reading them aren’t out to get me, but the last clearly laid out my next step will be to begin talking to attorneys regarding legal remedy, should they not honor my simple request. Just over this weekend, conversations have started taking place via email about how nefarious a precedent this inability to opt-out of an as-yet unproven measurement (of questionable value to anyone not in marketing/pr). I was just mentioned in a tweet demanding @Klout knock it off, with others. Social media has grown exponentially as people discover they have a voice online. Those who attempt to silence or otherwise ignore those voices often make themselves targets for society’s ire. I really don’t think this is what Klout is out to do. There’s merit in their research. There’s potential in their findings. But there is a lack of basic humanity in the way they’re going about it. And that’s wrong. And I will stand with those who fight it. Hi Nik. Thank you for all your support in dealing with this issue. This morning I received an email from Megan @ Klout advising they had deactivated the profile in question and asked me to allow up to 90 days for the profile to completely vanish from the internet. This is acceptable. For anyone coming across this conversation in the future, the profile I requested removed is/was located at http://klout.com/dr1665 if you’d like to see if things went to plan. Hopefully, this reflects a kinder, gentler Klout moving forward, demonstrating more respect for the individuals whose reputations they stand to impact through their measurement. Thanks Nicholas Butler and the rest! 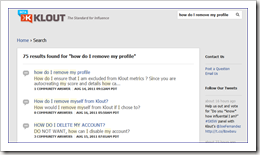 Thanks to all of you for giving information about how to get deleted from Klout. I sent another email and this time I got a response in 3 minutes saying they will get back to me in three days or less. Well see what happens. Not sure where to begin, so how about with full disclosure – I use Klout and I like the free stuff it gets me. You make a weak argument though. I understand your point to some extent, but the whole legal threat bit comes off a bit childish. What next, are you going to threaten suit against Google, Compete and others? Klout really is no different, all they’re doing is aggregating your “social data” which is freely available and used by many other platforms. If you don’t want to play their game, don’t play. But also, don’t blame them for your info being out there. I shouldn’t have to say this, but it’s the internet, try hard enough and you can find out most anything about anyone. Again though, I do somewhat understand your point, so I don’t mean to sound too one-sided. Yes, we should have a bit more control over our data online, but we don’t. So I guess the argument I would make is stop complaining about the system and play the game to your advantage. @ JGfromOC permalink, I will never use klout again. Any site that uses members information without their approval, I don’t need to be a part of. It’s not the information, It’s if I want to delete my account, there should be a button for that. No site should be able to hold anyone hostage, so they can count their fake money. I can do everything I want on the internet without klout. You play the game to your advantage, and I will play mine. Calling me out…Have fun with your free stuff!